The paper deals with the influence of the recycling of 1.2709 powder steel on porosity of the components produced by selective laser melting technology (SLM). 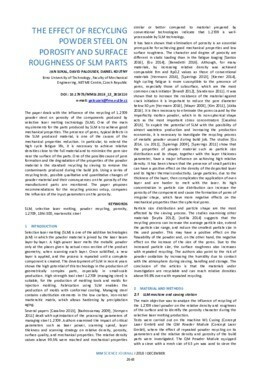 One of the main requirements for the parts produced by SLM is to achieve good mechanical properties. The presence of pores, typical defects in the SLM produced material, is one of the causes of the mechanical properties reduction. In particular, to extend the high cycle fatigue life, it is necessary to achieve relative densities close to the full material and to minimize the pore size near the surface of the parts. One of the possible cause of pore formation and the degradation of the properties of the powder material is the standard recycling by sieving to remove the contaminants produced during the build job. Using a series of recycling tests, possible qualitative and quantitative changes of powder material and their consequences on the porosity of the manufactured parts are monitored. The paper proposes recommendations for the recycling process setup, compares the influence of the input parameters on the porosity.